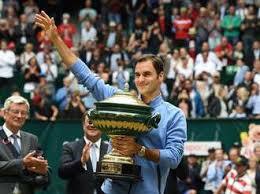 Federer thrashes Zverev to win ninth Halle title – Royal Times of Nigeria. The 35-year-old, who skipped the entire clay-court season, has still only lost two matches this year en route to four titles, including the Australian Open in January. Swiss great Roger Federer thrashed Alexander Zverev to win his ninth title at the Wimbledon warm-up tournament in Halle on Sunday. The top seed lost his first match of the grass-court season last week in Stuttgart to Tommy Haas, but was in imperious form all week at Halle, culminating in the 6-1, 6-3 final victory over the home favourite Zverev. Federer will head into Wimbledon, which starts on July 3, as favourite to win an outright record eighth title. “I played great, I felt good from the start,” said Federer. “My goal was to keep myself 100 percent for the grass season,” he added. Federer raced out of the blocks and broke serve twice to reel off the first four games of the match. The home crowd tried their best to get behind the world number 12 Zverev, and even though he got on the board in game five, Federer broke again to wrap up the opening set in just 23 minutes. Zverev, 20, battled hard to stay with his illustrious opponent at the start of the second set, but failed to make any inroads into the Federer serve. The 18-time major champion was in irresistible form and he brought up two break points after a scintillating rally. A trademark forehand passing shot and a comfortable service game moved Federer to within a game of victory. And he confidently served it out to wrap up the 92nd ATP Tour title of his career, which moves him to within two of second-placed Ivan Lendl on the all-time list.